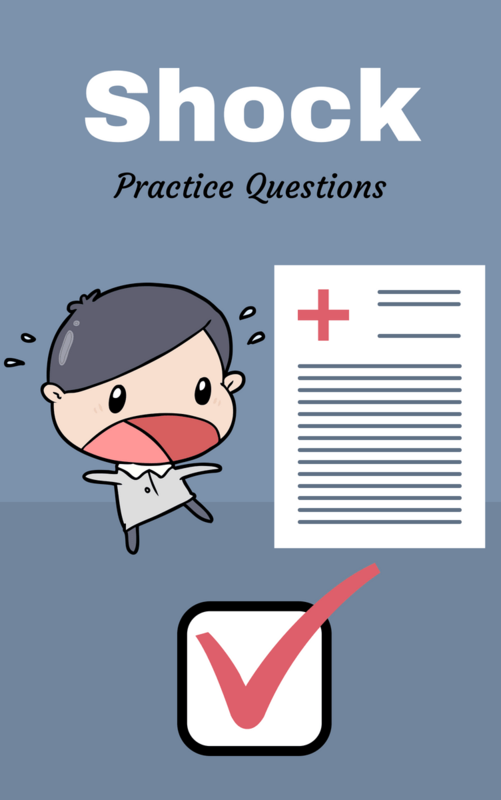 Are you a Respiratory Therapy student looking for practice questions all about shock? Well I have good news because as you will see in the study guide below, we have a ton of them listed out so that you can study and prepare to ace your exams. Shock is a dangerous state in which there isn’t enough blood or oxygen getting to your body tissues. It one of the topics that you will cover and need to know about in your Pathology courses in Respiratory Therapy school. Not to mention, you will also see a some questions about shock on the TMC Exam as well. So let’s dive into the practice questions below and get our study on, shall we? Shock is a syndrome that is characterized by decreased tissue perfusion and cellular metabolism. Cells are not getting what they need, so there is an imbalanced supply of oxygen and what cells need (nutrients). It is a condition in which the circulatory system fails to provide sufficient circulation to enable every body part to perform its function. It is also often called hypoperfusion. Basically, it is a life-threatening state of inadequate tissue perfusion. 2. What are the four types of shock? Hypovolemic, cardiogenic, obstructive, and distributive (anaphylactic, septic, neurogenic). It is the passage of fluid through the circulatory system or lymphatic system to an organ or a tissue, usually referring to the delivery of blood to a capillary bed in tissue. 4. What are the components of normal perfusion? Heart: pump function; blood vessel: container function; and blood: content function. 5. What are the primary causes of shock? Pump failure, poor vessel function, and low fluid volume. 6. What are the four distinct stages of shock? Initial, compensatory, progressive and refractory. 7. What causes anaerobic metabolism in the initial stage of shock? 8. Why does peripheral edema occur in progressive shock? Because all the fluid your body was trying to preserve during compensation is not being moved around anymore. 9. What is the refractory stage of shock? Irreversible cell death and organ damage, unresponsive to treatment and death is likely. 10. What is cardiogenic shock? 11. What is the main reason for cardiogenic shock? 12. What does cardiogenic shock cause? Inadequate heart function, congestive heart failure, myocardial infarction, severe mitral regurgitation, and ventricular tachycardia. 13. What is the treatment for cardiogenic shock? Keep the patient comfortable, high flow oxygen, assist ventilation ALS, and rapid transport. 14. What pulmonary issue can occur in cardiogenic shock and what can you treat it with? Pulmonary edema and you can treat it with diuretics. 15. What is obstructive shock? Obstructive shock is an impairment of the heart to pump effectively as a result of a non-cardiac factor. It is caused by mechanical obstruction which prevents an adequate volume of blood to fill the heart chambers. Two common causes are cardiac tamponade and tension pneumothorax. 16. How can you treat obstructive shock? Oxygen, keep warm and rapid transport, ALS. 17. What is anaphylactic shock? Anaphylactic shock is a life-threatening form of an allergic reaction due to massive vasodilation, widespread vessel permeability, or bronchoconstriction. Its causes include meds, foods, bites, sings, etc. This is a type of distributive shock. Signs and symptoms include hives/swelling/flushed color, weak pulse/hypotension, and severe dyspnea/wheezing/respiratory failure. 18. How do you treat anaphylactic shock? Advanced airway, high flow oxygen, and if directed epinephrine. 19. What is neurogenic shock? Trauma-based damage to the cervical spine widespread blood vessel dilation. It is caused by spinal cord damage, typically in the cervical region, which leads to massive vasodilation below the level of injury and relative hypovolemia results due to an increase in vascular space. Neurogenic shock interrupts normal communication pathways between the CNS and PNS, and interferes with compensatory mechanisms. Signs and symptoms of neurogenic shock are hypotension, warm skin, normal color, heart rate is not tachycardia (the nervous system cannot stimulate these things), paralysis, and respiratory paralysis. 20. What is the primary cause of neurogenic shock? 21. How can you treat neurogenic shock? Secure airway, C-spine, high flow O2, assist ventilation, ALS, keep patient warm and prompt transport. 22. What type of shock shows an increased cardiac output, fast capillary refill, and warm and flushed extremities? Septic shock is the only type that includes these characteristics. 23. What causes septic shock? It is caused by a severe bacterial infection. 24. How do you treat septic shock? Fluid resuscitation by administering a minimum of 20 ml/kg crystalloid to maintain 60-65 mmHg MAP. If fluid resuscitation fails, use vasopressor drugs (dopamine, norepinephrine are the first choices). Broad spectrum antibiotics should be administered within 3 hours while waiting on cultures. Fix any altered coagulation problem. This is due to inflammatory response, stimulation of the complement cascade, and reduction in protein C and antithrombin III. The patient should be put on corticosteroids to help with inflammation. 25. How is hypovolemic shock different from cariogenic and septic shock? Hypovolemic shock has many varied and diverse origins. 26. What are the causes of hypovolemic shock? Severe dehydration, vomiting, diarrhea (dehydrates you the quickest), burn, diuresis, blood loss, gynecologic, trauma, DKA, surgery (cauterization) and internal fluid collection (peritonitis or ascites). 27. What is often the main cause of hypovolemic shock? 28. What amount of fluid loss do patients be at risk of hypovolemic shock? More than 750 mL of fluid loss, cardiac output begins to fall and vital signs change (subtly). 29. How do you treat hypovolemic shock? Try to restore the fluid volume and blood pressure. 30. What is the pathophysiology for hypovolemic shock? Fluid loss causes the autonomic nervous system to initiate fight or flight, norepinephrine and dopamine increase to increase heart rate, vasoconstriction occurs trying to shunt blood to vital organs increased PVR. Patients’ peripheral extremities can be cool and clammy. RAS system attempts to increase BP and CO. A decrease in urine output and increase respirations can be observed. 31. What happens during the Initial Stage of Shock? It is usually not clinically apparent, only changes are on a cellular level. The body has been dealing with the imbalance on its own. 32. Which shock depends on fluid resuscitation? 33. What kind of IV is needed for shock patient? At least 2 large bore IVs with isotonic fluids since the liver is failing and lactated ringers cannot be broken down. Albumin, a fluid expander in the intravascular space, can be given since it won’t cross the membranes. 34. What happens if we give fluid too fast? There will be signs and symptoms of fluid overload. 35. What is the best thing for hypovolemic shock? Prevention, monitor ‘leaky’ patients and give fluids, oxygen, and monitor for fluid overload. 36. What is hypovolemic shock? It is a decrease in intravascular volume of at least 15%-30%. It is a fluid problem, loss of blood can cause this but also dehydration due to vomiting, diarrhea, or burns. Signs and symptoms include trauma/blunt/penetrating, bleeding, altered LOC, nausea/vomiting/diarrhea, and typical signs of shock. 37. What is distributive shock? It is a pipe (blood vessel) problem, occurs due to widespread vasodilation and increased capillary permeability, which causes blood pooling and relative hypovolemia (low volume relative to the size of vascular space), expands blood vessels making the vascular space bigger and volume inadequate for effective circulation. Different types of distributive shock are anaphylaxis, neurogenic, psychogenic and septic. 38. What is the compensatory stage of shock? Compensatory stage of shock is when the body is experiencing a state of low blood volume but is still able to maintain cardiac output by increasing the heart rate to restore tissue perfusion and oxygenation. The kidneys hold on to water (decrease urine output) and blood pressure goes up. 39. What happens in the progressive stage of shock? Compensatory mechanisms fail, blood pressure goes down, heart rate goes down, urine output decreased further and widened pulse pressure. 40. What are expected findings that all shock can cause? Chest pain, lethargy, somnolence, restlessness, anxiousness, dyspnea, diaphoresis, thirst, muscle weakness, nausea, and constipation. 41. What are the causes of cardiogenic shock? Myocardial infarction, heart failure, cardiomyopathy, dysrhythmias and heart valve rupture or stenosis. 42. What are the causes of obstructive shock? Blockage of the great vessels, pulmonary artery stenosis, pulmonary embolism, cardiac tamponade, tension pneumothorax and aortic dissection. 43. What are the three subtypes of distributive shock? Loss of sympathetic tone causing massive vasodilation due to a sympathetic response. 45. What are the causes of neurogenic shock? Head trauma, spinal cord injury and epidural anesthesia. Exotoxins and other mediators causing massive vasodilation. It is caused by severe infection, which damages blood vessels and increases plasma loss out of the vascular space. Vessels do not constrict well during septic shock, diminishing ability to compensate that leads to relative hypovolemia due to vessel permeability and fever. Signs and symptoms are fever/chills/weakness, recent illness/infection/surgery, altered LOC, increased respiratory rate, tachycardia, hypotension, pale/cool skin, weak peripheral pulse and loss appetite. 47. What vital signs can be observed with septic shock? Increased temperature, increased respiratory rate, hypotension, and tachycardia. 48. What is the most common cause of septic shock? 49. What is the pathophysiology of shock? Shock is poor perfusion (hypoperfusion) and inadequate tissue perfusion. Cells in the body do not get the oxygen and nutrients they need from the circulatory system. 50. What are the stages of shock? Compensated shock, decompensated shock, and irreversible shock. 51. What is compensated shock? It is the early stage of shock. The body is still able to compensate at this point for the hypovolemic state through defense mechanisms like tachycardia and peripheral vasoconstriction. 52. What is decompensated shock? It is the Late or progressive stage of shock. The body can no longer compensate for the hypovolemic state, so blood pressure starts to fall. 53. What is irreversible shock? The final stage of shock where the patient will not survive and systems start slowing down. 54. What are the early signs of shock (compensated)? Cold, clammy hands and feet; pale or blue-tinged skin tone; weak, fast pulse rate; fast rate of breathing; and narrowing pulse pressure. 55. What are the late signs of shock (decompensated)? Falling blood pressure (systolic of 90 mm Hg or lower with adults), weak, thread or absent peripheral pulses, ashy or cyanotic pallor, decreased mental status, and dilated pupils. 56. What are the three causes of shock? Pump (heart problems): MI, cardiac trauma; Pipe (blood vessels): anaphylaxis, spinal trauma, infection; and, Fluid (blood volume): bleeding, vomiting, diarrhea. 57. What are the compensation mechanisms? Tachycardia, peripheral vasoconstriction (will constrict vessels to try and increase blood pressure and increase perfusion to organs), and increased breathing rate. 58. What is one of the most pertinent late signs of shock? 59. What are the signs and symptoms of cardiogenic shock? Hypotension, portable cardiac history, chest pain, respiratory distress, pulmonary edema, and altered LOC. 60. What is cardiac tamponade? Fluid accumulation within the pericardial sac and compresses the heart, also called pericardial tamponade. Signs and symptoms include JVD, narrowing pulse pressure, and hypotension. 61. What is a tension pneumothorax? Air enters the chest cavity due to injury or sucking chest wound and accumulating pressure compresses the lungs. Signs and symptoms include JVD, respiratory distress, diminished lung sounds, poor compliance with BVM, and tracheal deviation toward the unaffected side (late sign). 62. What is psychogenic shock? Pseudo-shock caused by sudden, temporary vasodilation that leads to syncope. Psychogenic shock does not inherently present a sustained problem due to inadequate tissue perfusion. Sudden vasodilation interrupts blood flow to the brain, leading to syncope. 63. What are the early signs and symptoms of shock? Altered LOC (anxiety, irritability), tachycardia, pale/cook skin, weak peripheral pulses, increased respiratory rate, thirst, and delayed capillary refill. 64. What are the late signs and symptoms of shock? Falling blood pressure, irregular breathing, cyanosis, and absence of peripheral pulses. 65. How do you manage shock? Control bleeding (if any), put the patient in Trendelenburg position, prevent loss of body heat, and initiate rapid transport. 66. What are the main causes of respiratory emergencies? Medical conditions or traumatic injuries, chronic and acute and airway obstruction. 67. What is the timing of anaphylaxis? Onset can be almost immediate and is usually within 30 min of exposure to allergen. So there you have! That wraps up our study guide compilation on some of the best practice questions about shock on the web. I hope these were helpful for you and I know that if you study them enough, you’ll get every single question that concerns shock correct from this day forward. Thanks for reading and as always, breathe easy, my friend.